Facebook doesn’t care about you. They don’t care about humanity. They don’t care about their supposed mission to connect people and make the world a better place. They just care about money, and a new New York Times report details in an exhaustive manner how far these Silicon Valley slumlords are willing to go in order to protect their fundamentally broken product. Read the entire thing to get a full sense of their crimes against humanity, but this is the section of the report where their depravity is proven for the entire world to see. Mark Zuckerberg and Sheryl Sandberg—who are both Jewish—pushed the exact same anti-Semitic conspiracy theory that led to eleven Jews getting gunned down in a synagogue in Pittsburgh. The same conspiracy theory also helped drive Cesar Sayoc to attempt the largest mass political assassination since the night of Abraham Lincoln’s death. You couldn’t ask for a clearer example of how Facebook is not just complicit in fomenting political extremism across the globe, but how fundamental their role is to the spread of hatred. Members of the Myanmar military were the prime operatives behind a systematic campaign on Facebook that stretched back half a decade and that targeted the country’s mostly Muslim Rohingya minority group, the people said. The military exploited Facebook’s wide reach in Myanmar, where it is so broadly used that many of the country’s 18 million internet users confuse the Silicon Valley social media platform with the internet. Human rights groups blame the anti-Rohingya propaganda for inciting murders, rapes and the largest forced human migration in recent history. While Facebook took down the official accounts of senior Myanmar military leaders in August, the breadth and details of the propaganda campaign — which was hidden behind fake names and sham accounts — went undetected. The campaign, described by five people who asked for anonymity because they feared for their safety, included hundreds of military personnel who created troll accounts and news and celebrity pages on Facebook and then flooded them with incendiary comments and posts timed for peak viewership. Facebook could stop a lot of this hatred by fundamentally changing their platform to disincentivize hyperbole and sensationalism which drive so much engagement. It wouldn’t be easy, but the effort would certainly be applauded, earning them goodwill they haven’t experienced since Facebook was only available to people with a college e-mail address. Would this new, less extremist Facebook be as profitable as their current platform seemingly tailored to foment hatred? Probably not—and that’s why Facebook decided against making fundamental changes to its product, and instead deflected blame by spreading the exact same conspiracy theory that permeates throughout all of right-wing media. This is not a minor matter. Anti-Semitic violence is on the rise in this country, and now two of the most prominent Jews in America in Mark Zuckerberg and Sheryl Sandberg are actively making life more dangerous for Jews like me, all so they can protect their fundamentally broken product from the consequences of its dysfunction. There’s a word for people like Zuckerberg and Sandberg: traitors. Jewish historians will remember them as the Benedict Arnolds of this anti-Semitic moment in America. This is the kind of hatred which has come to define their product. Facebook’s profit motive is hatred, and this is where I absolve Facebook of some culpability in this mess: don’t hate the player, hate the game. This is capitalism. It has no moral center. It only has a profit motive, which capitalists have wrongly convinced us is inherently good. It’s not. It can be, but believing that profit is always a net good is as naïve as believing that unicorns exist, or that Donald Trump is capable of reading at a middle school level. Profit motives lead to things like keeping posts up espousing genocide because they get a lot of “engagement” (read: money). What we’re asking Facebook to do in order to address their fundamental problem is to reject capitalism in some sense, and frankly, there’s a better chance of me becoming CEO of Facebook by the end of this column than that happening. But we’re not completely helpless in the face of Facebook’s off-the-rails capitalism. Supply and demand—not capitalism—is the elemental economic principle which all transactions rely upon. As someone who spent four-plus years of his life trying to create a social network, I can promise you that Facebook needs you more than you need them. You provide both the supply and the demand. You are the product. That’s why everyone in Silicon Valley is so terrified of coming off as anti-conservative. They know that they don’t need to be concerned over liberals abandoning their product en masse, while conservatives promise to do exactly that all the time. It’s a simple reaction to a perceived supply and demand equation. Fellow liberals, it’s time that we shifted that dynamic. So let’s kill it. The power to undo Facebook is right there, in your adorable hands. Elon Musk, of all people, just exercised it. You’ll still be able to contact friends. You’ll still be able to get into unwinnable political arguments online with acquaintances who are nine degrees removed from your actual friends and family. You can Snapchat. LinkedIn will still be around if you need to contact people for exploratory job interviews that go nowhere. You’ll even be able to check out incoherent conservative memes cooked up by nursing-home residents. You won’t miss out on any of that good stuff if you don’t want to. 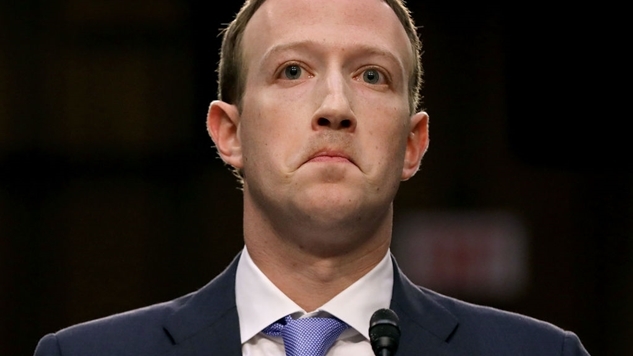 The only difference is that Mark Zuckerberg will be ruined, and that’s a vast improvement over how things are right now. We have the power to destroy Facebook. There’s no reason that it can’t go the way of MySpace or Friendster. Facebook has weaved its way into the infrastructure of the web, so it is far more difficult to uproot than its predecessors (like how it’s virtually impossible to run social media for a company without a personal Facebook account), but its value to that basic infrastructure would wane if its central product lost value. Your personal information is Facebook’s currency. If you remove your personal information, Facebook has less currency. It’s really that simple. It will take quite some time and it will be a slow death, but a slow, painful death is what Facebook deserves. Fellow Jews and liberals, Mark Zuckerberg and Sheryl Sandberg have proven time and time again that they take all of us for granted, so please prove them wrong and join me in deleting Facebook once and for all.